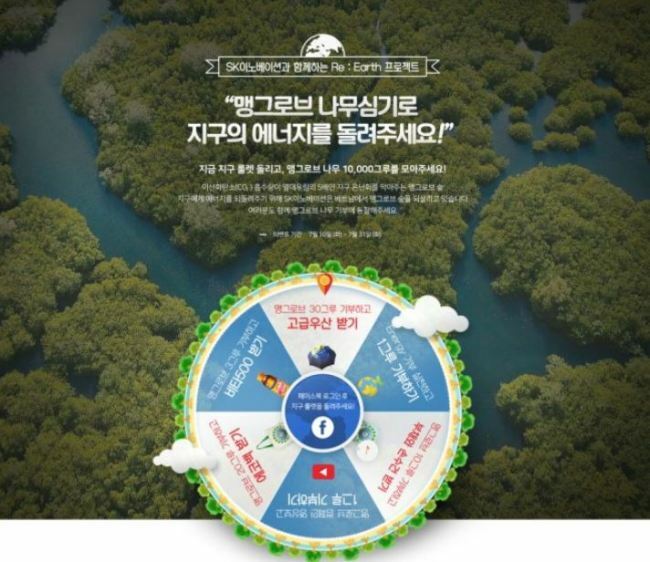 South Korean oil refiner SK Innovation has started a mangrove tree donation campaign on its Facebook page to restore the mangrove swamp in Vietnam, the company said Wednesday. The event aims to raise awareness of the importance of preserving the ecosystem by donating 10,000 mangrove trees until the end of this month. As of Tuesday, some 3,000 people have participated in the event, collecting over 5,000 trees in eight days. “The campaign will be funded by employees and executives of SK Innovation who donate 1 percent of their monthly income for the cause. We will expand opportunities for consumers to take part in creating such social value,” the company said. Mangrove swamps take in carbon dioxide five times the amount of tropical forests of the same size. But about 70 percent of the forests have been damaged due to excessive development over the years. Social media users can participate via www.facebook.com/If.SKinnovation. SK Innovation employees had planted 1,000 trees in Vietnam with locals ahead of the June 5 World Environment Day following a memorandum of understanding the firm signed with the Vietnamese government, regional governments and United Nations Environment Programme, the company said.